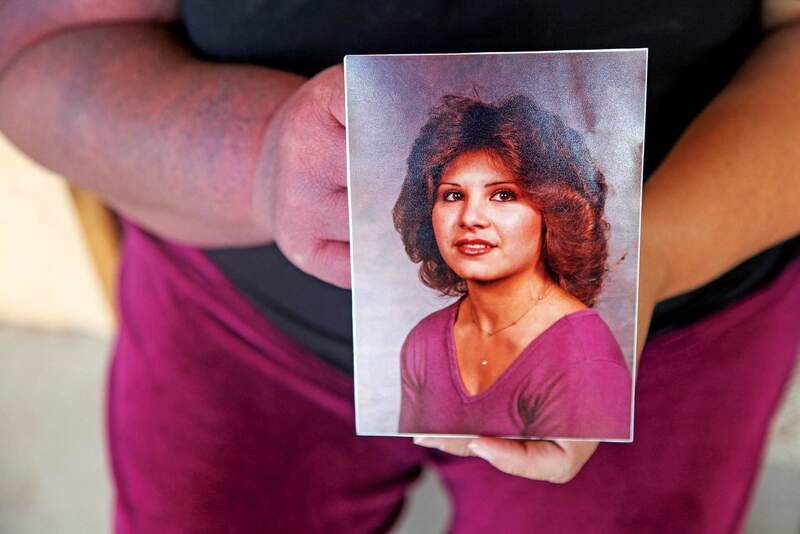 Sandra Padilla-Ramirez holds a photograph of her sister Peggy Sue Padilla at their family’s home in Arroyo Seco in Espanola, N.M. Leonard Coriz, the boyfriend prosecutors say killed Padilla by running her over with his truck, claimed it was all an accident. Women are more likely to be killed by men in this state than nearly any other, according to an annual study by the Violence Policy Center. Serenity Rodriguez, 3, walks by a stick in the ground marking the location where her grandmother Peggy Sue Padilla’s body was found in Arroyo Seco in Espanola, N.M. Leonard Coriz, the boyfriend prosecutors say killed Padilla in July 2015 by running her over with his truck, claimed it was all an accident. But this was no accident, a state judge said last year when he sentenced Coriz, 56, to five years in prison for manslaughter. 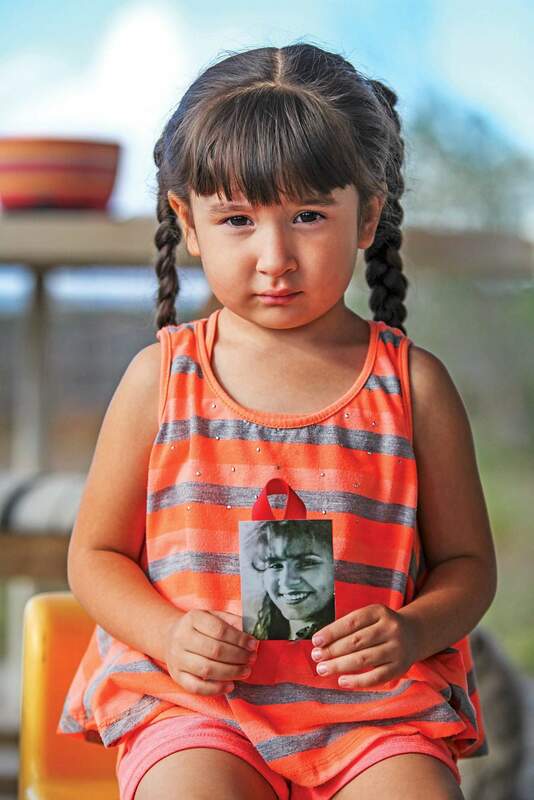 Serenity Rodriguez, 3, holds the photo of her late grandmother, Peggy Sue Padilla, at the Padilla’s home in Arroyo Seco in Espanola, N.M. Leonard Coriz, the boyfriend prosecutors say killed Padilla in July 2015 by running her over with his truck, claimed it was all an accident. But this was no accident, a state judge said last year when he sentenced Coriz, 56, to five years in prison for manslaughter. SANTA FE (AP) – Peggy Sue Padilla lay dead in her driveway during a night of rainfall, and it was morning before anyone found her. Leonard Coriz, the boyfriend prosecutors say killed Padilla by running her over with his truck, claimed it was all an accident. The couple had been gathering wood earlier that day in July 2015 and got into an argument when they returned to her Arroyo Seco home. Coriz maintained he did not see Padilla, 49, as he drove away. But this was no accident, a state judge said last year when he sentenced Coriz, 56, to five years in prison for manslaughter. An accident is something you do not see coming, the judge said. Everyone could have seen this relationship was going to end badly. “We figured something was going to bust,” Padilla’s father, Michael, said on a recent rainy morning as he sat in his home near his daughter’s old trailer. In the end, Padilla – a cosmetologist and a grandmother who now has another grandchild on the way – became another data point in statistics that have given New Mexico a grim distinction. Women are more likely to be killed by men in this state than nearly any other, according to an annual study published August by the Violence Policy Center. The study found the state has the 10th-highest rate of women killed by men, marking the third straight year the Land of Enchantment has appeared toward the top of the list, while New Mexico’s overall homicide rate has ranked lower. Coming only a few months after a legislative study described New Mexico’s response to domestic violence as fragmented and uncoordinated, advocates say the numbers demand the state do more to support victims of abuse. Meanwhile, families like Padilla’s grow frustrated with a criminal justice system they feel is too lenient. The study counted 16 women killed by men in New Mexico during 2015, the most recent year for which data are available. That is a rate of 1.52 victims per 100,000 women, higher than the national rate of 1.12, though the study does not include cases with multiple victims but only cases with one female victim and one male killer. Nearly all were killed by someone they knew. And most killings were not connected to any other felony. Half followed arguments between the victim and her killer. Seven women were killed with firearms, five with knives or other cutting instruments and two with blunt objects. New Mexico has ranked among the 10 states with the highest rates of women killed by men six times during the last decade. It fits something of a pattern in the annual report. Most of the other states in the top 10 are in the West and Southeast. At the top of the latest list, for example, is Alaska, followed by Nevada and Louisiana. The study excluded Florida and Alabama because of differences in how those states collect data. But both have ranked highly in the past. “The states that tend to show up at the top of the ranking tend to be the same states,” said Kristen Rand, legislative director at the Violence Policy Center, a nonprofit organization in Washington, D.C., that publishes the annual report. The Violence Policy Center promotes gun control laws. Rand says a common thread between each state at the top of the list is a high rate of firearm ownership. But Rand also points to domestic violence and argues high rates of women killed by men call into question what states are doing to protect as well as support victims. “What we’ve heard from advocates in a lot of these states, particularly in the South, is you have this combination of a gun-centered culture and a culture of treating women as second-class citizens, and a lack of really prioritizing resources to get women out of these situations,” Rand said. Advocates in New Mexico say the state can do far more to support victims of domestic violence. Research by the New Mexico Intimate Partner Violence Death Review Team, which issues its own annual study using different criteria, has found that most offenders had histories of abuse. Most also had known histories of abusing alcohol or other drugs. And in recent years, the team has found most victims did not have any contact with support programs or advocates before their death. A study published in June by the Legislative Finance Committee described New Mexico’s response to domestic violence as fragmented and uncoordinated. The committee’s report said New Mexico spends little on treatment programs for domestic violence offenders and has little evidence of the effectiveness of those programs. The report also highlighted scant oversight for many offenders. Battery on a household member is a misdemeanor, for example. But magistrate courts, which handle misdemeanor cases, do not actively monitor offenders serving probation for domestic violence. Victims often are left with little help to navigate a legal system that is complex and daunting. Many cases are not prosecuted, according to the committee’s report. And advocates argue there is not enough support – especially for a vast, rural state that is one of the nation’s poorest – to help victims leave abusive partners. The Violence Policy Center and the review team both have recommended the state do more to keep guns out of the hands of abusers. New Mexico lawmakers approved a law to do exactly that earlier this year. Senate Bill 259, sponsored by Sen. Joseph Cervantes, would have created procedures requiring men under domestic violence restraining orders to relinquish their firearms. That is already required under federal law. But New Mexico is among a few states that do not have policies in place for its courts to impose such restrictions. Being a former prosecutor with a “tough-on-crime” reputation, Republican Gov. Susana Martinez surprised the bill’s supporters when she vetoed it. She encouraged judges to exercise the power they already have under existing laws. Miranda Viscoli, executive director of New Mexicans to Prevent Gun Violence, said that leaves judges without a clear policy. There are some signs of progress in New Mexico. The state’s rate in this latest report is lower than its average over the last decade, though it has changed sporadically from year to year. Meanwhile, advocates for victims of domestic violence tout efforts to train first responders on identifying signs of strangulation and to train law enforcement on prosecuting domestic violence cases if a victim cannot cooperate. Padilla’s case had nothing to do with firearms or probationers, though. For her family, what is most concerning are prison sentences they believe are too lenient. Coriz will be out of prison within a few years. Padilla had been dating Coriz for about a year before her death, her family members said. And her family had concerns about him and their arguing. Though originally charged with murder, Coriz took a deal from prosecutors and pleaded guilty to homicide by vehicle, a third-degree felony. Murder would have been a tough case to make, and her family was not eager to go through a trial. Still, a five-year sentence seems lax, her sister Sandra said.